PORTLAND – Few things are harder to accept in sports then the finality of a season ending. The NCAA Tournament can be one of the most thrilling months on the sports calendar but also the most emotional with its single elimination format. Hundreds of collegiate careers are over in a flash. 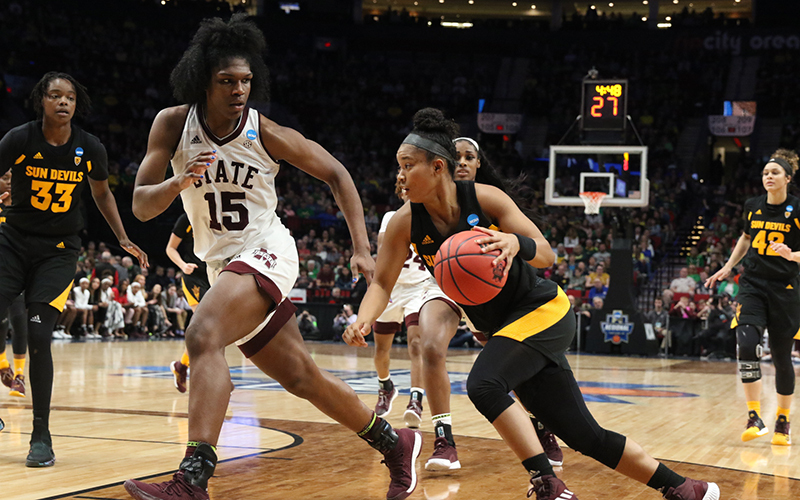 For the Arizona State women’s basketball team, its season came to an end Friday night in the Sweet 16 falling to No. 1 seed Mississippi State 76-53. “Really proud of this team and everything they accomplished this year,” ASU coach Charli Turner Thorne said. It’s been quite a ride for the senior group of Courtney Ekmark, Kianna Ibis, Charnea Johnson-Chapman and Sophia Elenga. Ekmark, an Arcadia native, returned home to play at Arizona State after winning two national championships at Connecticut, finishing as one of the most prolific 3-point shooters in school history. Ibis and Johnson-Chapman sat on the bench for their first two years in Tempe behind a talented, veteran frontcourt and emerged as highly productive players these last two seasons. Elenga, a transfer from Cochise College, came to ASU last season and blossomed as a key contributor off the bench. These four have left an indelible mark on the program. Among those in the next senior group is junior Reili Richardson, who reflected on what the seniors have meant to her. Ibis hopes this senior class is remembered for their work ethic. Turner Thorne said this senior class lived up to her high standards she has set for this program, on and off the court. Arizona State struggled to get in a flow all game against Mississippi State as the Bulldogs bullied the Sun Devils inside. ASU finished the game committing 27 fouls as three players fouled out with Ibis finishing with four fouls. Mississippi State shot 25 of 35 from the free throw line while the Sun Devils were just 7 of 12. Arizona State also committed 16 turnovers which led to 17 points for the Bulldogs. Ibis said it was the most physical team they’ve played all season. After returning their whole roster from last season, the Sun Devils will be going through a passing of the torch as the senior frontcourt passes it to the rising senior backcourt. “We’ve got a lot returning. We’ve got some really dynamic players coming in, so I think we’re going to look different,” Turner Thorne said. “I think we’re going to be much more full court, fast pace, up tempo. We’re going to have Jamie (Ruden) and Eva (Rubin) to anchor everything, but everybody around them is fast pace and athletic.